Every two years I am privileged to watch the greatest athletes in the world come together for the summer and winter Olympics. For me the stories of loss, overcoming injuries, and the strength and determination of the human spirit are the highlights of the Olympics. The human side of performance is awe inspiring, and profoundly moving to me. Every Olympics has its own inspirational stories. Dan Jansen’s story of losing his sister to cancer hours before competition, falling, and finally winning a Gold medal after years of loss and frustration still moves me to the core. Raj Bhavsar and his “never give up” spirit helped him overcome two Olympic team rejections and win a Bronze medal in Beijing. Dan O’Brien faced Olympic disaster, stepped through his fear, and became an Olympic decathlon champion. Last night I witnessed an Olympic moment that moved me profoundly, and inspired me to want to do greater things with my life. Joannie Rochette of Canada skated in the women’s figure skating short program less than forty eight hours after her mother, Therese died of a heart attack. Her mother passed away Sunday evening after arriving in Vancouver to watch her daughter skate for Canada in the Olympic Games. Her performance was spectacular. The crowd at the Pacific Coliseum gave here a thunderous ovation before she started her program and were with her at every turn and toe loop of her routine. I watched in amazement as she gracefully skated, jumped, and glided her way to a third place finish leading into Thursdays freestyle program. It was when she finished her routine that I lost it. Joanie held her emotions in check for the entire routine and when she skated to a stop her grief exploded to the surface. Not just crying but sobbing and heaving from deep within her body. Her coach held her for moments as the crowd erupted into a prolonged celebration of her strength, courage, will, and determination. It was the perfect honoring of her mother and everything she has meant to Joannie and her life as a skater. So why does this touch me so deeply? In my work with athletes we always talk about keeping focused, learning how to manage distractions and maintain ideal levels of pressure to perform at their best. Athletes get worked up about college coaches being in the stands, having a big competition to attempt to make a team, making an out on their last at bat, dropping a pass, and many other sources of stress and pressure that affects their ability to maintain focus in competition. One gymnast I worked with got upset because little kids in their Mom and Me class walked by the apparatus she was training on and she got distracted. Now lets put this in perspective. A kid drops a pass and it is the end of the world. A bunch of toddlers walk by and an athlete freaks out and loses focus. And Joannie Rochette skates the best program of her life less than forty eight hours after her mother dies and she is skating at the Olympics! I have worked with Olympic athletes and a big part in preparing for the Olympic games is learning how to handle the pressure that comes with participation in the biggest sporting event in the world on the biggest stage the world of sports has to offer. The pressure in an Olympic venue is intense. You can feel it when you walk into the arena. So if Olympic pressure is off the charts, how does an athlete like Joannie skate the routine of her life with all of the distractions going on around her? Her ability to manage her emotional shock, contain her sadness, sorrow, and grief that was trying to force its way to the surface, and maintain focus and composure was a moment of Olympic Glory that I will always remember. I am sure her story will be told during future Olympic broadcast. I will find a copy of this story and show it to the athletes I work with to inspire them and show them that the human spirit can accomplish amazing things in the face of monstrous distractions and pressure. I believe that Joannie transcended her ego, the part of our mind that measures pressure and expectation, and skated purely from her heart and her soul. She was able to step into a pure, clear, and centered place and allow her body to flow easily and effortlessly. She skated the best routine of her life because it didn’t matter that she was at the Olympics. It didn’t matter that she was skating before her home crowd in Canada. All of her past failures, mistakes, injuries and upsets faded away because she was skating from what I call a “centered” place. She was centered mentally, emotional, spiritually, and physically during her routine. She was able to let go and let her heart and soul show her body how to skate freely, gracefully, and effortlessly. When she ended her skate she stepped out of this sacred space and into the deep and conscious realization that she has lost her Mother, the understanding of what has happened over the last two days, the power of knowing she was strong enough to contain the enormity of the event and grasp the magnitude of what had just happened on the ice. Joannie showed strength, grace, dignity, humility, power, courage, and a tremendous ability to focus. These are all of the traits present when an athlete transcends the limits of the human body and reaches a peak level of performance. If you were to asked Joannie how her performance felt I am sure she would say ’surreal”. It was a beautiful moment – a moment of true Olympic glory. Pressure is an internal or external force that can influence performance in a negative or positive way. How you handle pressure will be a key factor in determining how well you perform on the gym floor. 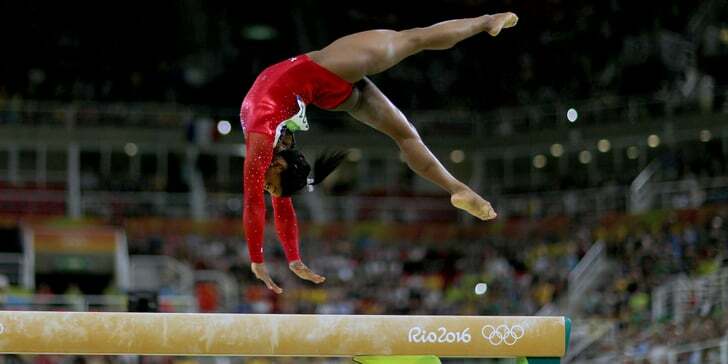 Gymnastics, perhaps more than any other sport, is executed under tremendous pressure. All eyes are on the competitive gymnasts, and the higher your level of competition, the greater the levels of stress and pressure. Level five gymnasts will not feel the same level of pressure as a gymnast in the Olympic trials feels. External pressure comes from outside sources like coaches, parents, and specific situations in competition. Internal pressure is self induced pressure that is the by product of negative thoughts and self talk, perfectionist attitudes, and self induced stress. Pressure itself is not a bad thing. It is a necessary ingredient to achieve peak levels of performance. Too little pressure and you are not mentally or physically ready to perform. Too much pressure and your mind creates negative and stressful thoughts. Your body tightens up and performance is hindered. Every athlete has an optimum level of pressure that helps them reach their peak in performance. By gaining an understanding of this pressure principle you can learn how to move your mind and your body into the peak range of performance pressure. Make an L shaped line. Number it from one to ten under the horizontal line. Number it from one to ten to the left of the vertical line. The horizontal line measures pressure. One represents little or no pressure and ten represents tremendous pressure. The vertical line measures performance. One represents low levels of performance, and ten represents high levels of performance. Somewhere on that continuum is a representative level of pressure that allows you to perform at your best. Just the right level of pressure creates the highest level of performance. For example, Raj Bhavsar has an optimum level of pressure in the seven range. This means that to perform at his best, he has to get the internal pressure he feels to a seven on the pressure/performance scale. If he is at a two or three he does not have enough pressure to perform at his best. He is not stimulated enough to reach peak performance levels. At a nine or ten he has too much pressure and his body tightens, his mind begins to create stressful thoughts and his performance suffers. In the team finals of the Olympic Games in Beijing, Raj had to hit his pommel routine to help keep the U.S. mens hopes for a bronze medal alive. Raj hit the routine, Sasha Artemev followed by hitting his now famous anchor routine and the U.S. mens team against all odds captured the bronze. When Raj saluted the judges the energy in the arena was electric. It was absolutely quiet, but the intensity was beyond measure. My hands were sweating, my heart was racing, and I noticed I was not breathing. Keep in mind I was only a spectator. Raj was an Olympic gymnast being asked to hit a critical routine on the biggest stage in sports, under enormous pressure. This moment could define his career as a gymnast. At dinner after the Olympics I asked Raj if there was anything he did to help him stay centered and focused at that moment. With millions of television viewers, the entire U.S. gymnastics community at home, and twenty thousand spectators in the National Indoor Stadium watching, how did you do it? Raj utilized the pressure principle to move his stress level down as much as he could. He knew the pressure was not going to go away, but he also knew that breathing calms the mind and body, and lowers pressure. Put this tool to work in your own training and competition routines. Practice working with the pressure principle. See it in your mind. Visualize the graph and identifying your optimum level of pressure. Begin to create awareness of this concept by working with mental imagery and breathing to move your pressure level to just the right place.